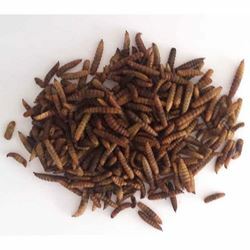 New from United Reptiles Dried Calci Worms (black soldier fly larvae) offer your pets an all natural calcium rich treat. These Calci Worms are high in protein to support strong and healthy growth. Black soldier fly larvae are considered the best new alternative for incorporating calcium and protein into an animal's diet. During its larva phase, the black soldier fly feeds off various kinds of organic material, converting this to proteins. This is why Calci Worms have such a high nutritional value. The variety of natural colors are eye-catching to all animals and the great taste will keep them coming back for more! Excellent for Backyard Chickens, Bluebirds, Sugar Gliders, Hedgehogs, Squirrels, Skunks, Reptiles, and other insect eating animals. 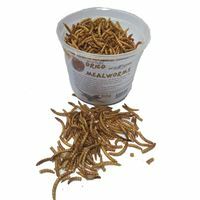 Calci Worms are naturally sun-dried to maintain their nutritional value and store for a year or longer. No refrigeration necessary! Excellent source of protein & suitable for sugar gliders, hedgehogs, wild birds, chickens, turtles, tropical fish, reptiles and other insect eating animals. FEEDING INSTRUCTIONS: Calci-Yum Worms can be offered straight or mixed with other foods to make a custom blend. Place in a feeder or sprinkle on the ground to encourage natural foraging behavior. EZ-Worms offer your animals an all-natural, high-protein, calcium-rich food source! 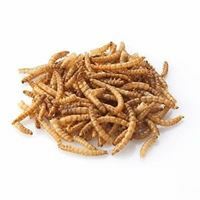 EZ-Worms is a premium blend of Dried Mealworms and Dried Calci-Worms (black soldier fly larvae). 2 to 3x the size of regular Mealworms! Ideal for feeding: Wild Birds, Reptiles, Amphibians, Fish, & Poultry Try "Super-sizing" your pets next meal with Dried Super worms! 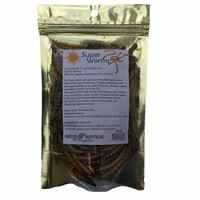 Super worms are 2-3x the size of regular mealworms, and are a good addition to any dietary feed for wild birds, reptiles, amphibians, poultry, and even fish.